Doctor Who Tardis and Dalek Molds Just $3! Down From $15! You are here: Home / Great Deals / Doctor Who Tardis and Dalek Molds Just $3! Down From $15! 13 Deals has these Doctor Who Tardis and Dalek Molds on sale for $3 (Reg. $15)! Create a feast fit for the Doctor in these TARDIS silicone molds and combination Tardis and Dalek molds. The large Tardis mold holds one cup of liquid, perfect for single-serve gelatin molds, cakes or other delicious treats! The combination Dalek and Tardis molds feature 3 Tardis and 3 Daleks each measuring approximately 2.5 inches tall. 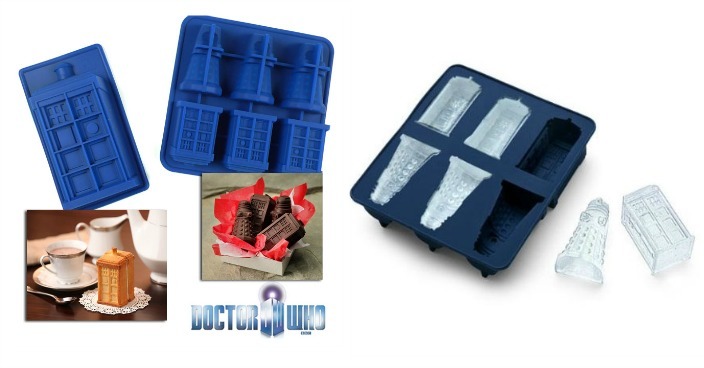 The combo Dalek and Tardis molds are perfect for making everything from ice-cubes to candy!